Unfortunately, discovering “bugs” in your oatmeal or finding little crawlies in your crackers isn’t that unusual. There is a wide variety of stored foods that are commonly infested with bugs including flour, cereals, cracked grains, baking mixes and processed foods, crackers, macaroni, cured meats, powdered milk, dried fruits, nuts, popcorn spices, and other grain-based items such as pet foods. These adult pests and their larvae wind their way down the distribution chain from the raw materials supplier to the manufacturer to the local grocery store and finally to your home pantry as stowaways inside a box or bag of cereal, flour, pasta or other food product. Pests of stored foods are among the most annoying and stubborn of insect nuisances. Left unchecked, these filthy insects can quickly spread throughout a house, climbing up walls and thronging around windows. However, even if confined to the kitchen, these pests can quickly infest an entire pantry boring holes from one container to another. Serious illness can result if these tainted food products are accidentally consumed. Also, a number of these pests can trigger allergies and skin conditions. Pantry pests are an unsafe, unsanitary condition for your family. This is one type of pest infestation that must be immediately and decisively resolved. For your family’s health, please consider using a pest control professional like Cowleys Pest Services. Cowleys has significant experience in the restaurant industry. We have the know-how to safely deal with all types of pest infestations in sensitive food preparation areas. Let us rid your kitchen and home of these pests while ensuring family and pet safety. You don’t have to wait until you see bugs in your cereal to know that you have a pantry pest problem. Usually, there are signs of a problem will before a beetle is staring you in the face in a food bowl. These insects are not subtle and usually leave signs of their presence. Periodically inspect the outside of stored boxes on your pantry shelves for signs of insect damage – small bored holes, chewed off edges, etc. Look inside. If a container of flour or cereal has lumps of food clinging to the side, you probably have flour beetles. If the food is crisscrossed with webbing, insect young have spun their cocoons and are resting before emerging as egg-laying adults. Shake the container. You may see food that is dirty with droppings, cast-off larval skins and partly chewed particles. In heavy infestations, some insects give off a peculiar odor. Flour beetles have an oppressive, penetrating scent, while the smell of crushed mites has a minty smell. There are many different insect pests capable of infesting stored food products. The following are the most common pantry pest infestations in New Jersey. If you find bugs or larvae in your stored foods, one of these is the likely culprit. 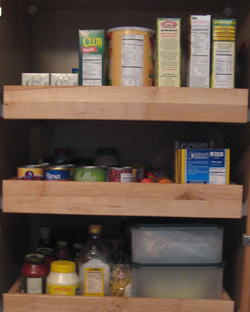 Beetles and weevils (snout beetles) are the largest category of pantry pests. That is hardly surprising considering that this order of insects represents about 40% of all insect species and almost 25% of all known life forms. The flour and grain beetles often called “bran bugs,” are small reddish brown beetles in and around stored cereal grain products and are one of the most common and destructive insect pests known for attacking stored flour and grain. These pantry pests move from silos and warehouses and food production facilities to grocery stores and finally to your home hidden away in some innocent-looking box of crackers, pasta, or cereal. The usual suspects in this group are the Saw-toothed Grain Beetle, the Confused Flour Beetle, and the Red Flour Beetle. The Saw-toothed Grain Beetle is a tiny beetle about 1/10 of an inch long whose flat shape allows it to penetrate sealed packages and may be brought into the home in groceries. The insect gets its name from six tooth-like projections on each side of the thorax. The Confused Flour Beetle and the Red Flour Beetle are close in appearance and habits. The “confused” in the beetle’s name is due to it being commonly confused with the Red Flour beetle, not because of its walking pattern or because it is suffering from some sort of beetle dementia. These beetles are too small to feed on intact whole grains and feed on a wide variety of foods including processed grains, cereal products, and other starchy materials. Hundreds of these insects may live and reproduce in a small box of infested foods and the adults can easily migrate throughout the kitchen. The Anobiid beetles include the Cigarette Beetle and the Drugstore Beetle. They are also similar in appearance and habits. Both are about 1/10 inch long and covered with small “hairs” giving them a silky, yellowish brown color. The larvae of both species are C-shaped and are creamy white except for the yellow head and brown mouthparts. Despite the name, cigarette beetles, while fond of cigarette products, attack a great variety of foods and even non-foods like leather and furniture stuffing. Drugstore beetles are one of the toughest pantry pests with the eerie ability to thrive on poisons like aconite, belladonna, and strychnine. This beetle can attack almost any dried food and has been known to bore through a whole shelf of books as well as tinfoil and sheet lead. The Dermestid beetles (Hide beetles) are scavengers that feed on a wide variety of products of plant and animal origin like dried meats, dead insects, hides, and woolens with the larvae doing the most damage. These beetles include warehouse beetles, cabinet beetles, carpet beetles and larder beetles. The fuzzy slow-moving larvae of cabinet beetles are often found in infested food product while the adults are around lights or windows in the area of the infested food. Dead adults are often found in windowsills because they fly to the light, trying to get outside. Carpet Beetles destroy fabrics with the larval stages and generally feed on wool and other natural fibers. They feed on carpets, clothing, furniture and other household items made of animal products, but are also capable of contaminating food causing severe digestive upsets. The pests themselves can bring on allergies. Larder Beetles prefer products of animal origin such as dried meat and cheese and are often found infesting stored pet foods. Other common pantry-invading beetles include spider beetles such as the brown spider beetle and the American spider beetle. These beetles, which may be found infesting all types of stored food products, have long legs and a general spiderlike appearance. The Cadelle beetle is a frequent pantry nuisance that can gnaw through sacks and cartons. They like to lay their eggs under loosened carton flaps. Weevils are extremely destructive long-snouted beetles whose larvae feed on the inside of stored dried peas, beans, unbroken grains, and fruits. Granary and rice weevils have long, hard snouts enabling them to bore through hard substances. Because they feed on whole grains, common sources of infestations in homes are popcorn, birdseed, decorative Indian corn, and nuts. These moths, which are a major pest in grain mills, can do much damage in the home. The adults are harmless, but their larvae spin cocoons in our food and otherwise contaminate it. They’re extremely destructive. If you find “white worms” and webbing in any foods, they may well be grain moth larvae. The Indian meal moth is the most common food-infesting moth found in homes, grocery stores and any place where dried pet foods are produced or stored. Food infested with these insects will have silk webbing present, especially near the food surface. Home infestations often get started through dried pet foods or birdseed. Nuts are a favorite breeding source; infestations have been found in nut caches of squirrels in attics and chimneys. Grain mites are small, pale grayish soft-bodied creatures almost microscopic in size. They are often found in stored grain and eventually may be brought into the home in grain food products. In damp conditions, they build up rapidly to populations that make infested foot seem to be alive with the mites. Mites spell trouble for humans. They carry tapeworm and cause kidney and skin problems. Grocer’s itch is a severe dermatitis caused by mites. Cheese Skippers, also called Ham Skippers, are flies that receive their name from the unusual ability of the larvae to propel themselves through the air. The flies, which feed on decaying matter, are often found in salted meat and overripe cheeses. Unintentional human ingestion of cheese skipper larvae causes the maggots to pass through the digestive system, leading to serious intestinal lesions that result in a variety of gastric symptoms. They are often cited as a cause of accidental enteric (intestinal) myiasis where the fly larvae invade living tissue. Insect groups similar to the cheese skippers include black scavenger flies, eye gnats, and small fruit flies. For pantry pest prevention tips, or for help with other forms of pest control in your home, contact the professionals at Cowleys Pest Services. We proudly offer our pest control service in Lakewood, Woodbridge, Edison, Toms River, Brick, Trenton, Piscataway, Old Bridge, Middletown, Princeton Junction and surrounding New Jersey.